Bernie Sanders is on his way to an endorsement of Hillary Clinton, the candidate of War, Wall Street, and Wal-Mart. Sanders ran as a New Deal Democrat, but he will soon be campaigning for a plain old corporate New Democrat. To keep his troops engaged through this transition, Sanders will stage a few rules and platform fights at the convention. But rule changes are irrelevant to the real party power structure of candidate organizations and their corporate investors. Any platform planks won will be irrelevant as well. No corporate Democrat will feel bound by them. The Green Party tried this in 2004. After a controversial decision to nominate the safe states candidate, David Cobb, it quickly became clear that the approach was impractical. I compiled and contributed to a book about this experience where you can see the debate between safe states and independent politics evolve as the case for safe states collapses in the face of political realities. Cobb had to convert from “safe states” to “smart states,” which meant running wherever local Greens wanted him to. That turned out to be every state, safe or battleground, with a Green Party. Cobb did not want alienate Greens in battleground states like Ohio and Pennsylvania who were knocking themselves out to overcome difficult ballot petitioning requirements and hoping for sufficient Green presidential votes to secure ballot access for local candidates in future elections. It also became clear that few voters or reporters would take a candidate seriously in a non-competitive safe state who didn’t believe his or her own third-party candidacy was important enough to carry into the competitive battleground states as well. A hypothetical Sanders safe states run would face the same problems Cobb did on a larger scale. His supporters in battleground states would feel abandoned. That would split his base. And he would not be taken seriously by voters or the press because he would not be taking himself seriously enough to run in the battleground states and try to beat both Trump and Clinton. Another liberal illusion is the inside-outside strategy toward the Democratic Party. The logic of an inside-outside approach leads increasingly inside in the party. To be accepted inside one must disavow outside options. Bernie Sanders conceded to this logic from the start of his campaign when he said would support the Democratic nominee and not run as an independent. If Sanders had not made that pledge, he would not have been allowed on to Democratic ballots or debate stages. Soon after he pledged his Democratic loyalty, Sanders was signing fundraising letters on behalf of the Democratic Senatorial Campaign Committee. Before long Sanders will be campaigning for Clinton. When I wrote a critique of this idea in the Summer 1989 issue of New Politics, I was addressing the left wing of Jesse Jackson’s Rainbow Coalition, which proposed an inside-outside strategy of supporting progressives inside the Democratic Party and running progressive independents against corporate Democrats. By the time the next iteration of the inside-outside strategy was promulgated by the Progressive Democrats of America, which grew out of the Kucinich campaign in 2004, outside was now reduced to lobbying the Democrats for progressive reforms. Running independent progressives against corporate Democrats was not part of the outside strategy anymore. The inside-outside proponents from the Rainbow Coalition believed their strategy would heighten the contradictions between progressive and corporate Democrats, leading to a split where either the progressives took over the Democrats or the progressives broke away to form a viable left third party with a mass base among labor, minorities, environmentalists, and the peace movement. But the logic of working inside meant forswearing any outside options in order to be allowed to inside Democratic committees, campaigns, primary ballots, and debates. Many of the Rainbow veterans became Democratic Party operatives and politicians whose careers depend on Democratic loyalty. Meanwhile, the corporate New Democrats consolidated their control of the policy agenda. And today the “outside” of the inside-outside strategy has been scaled down to pathetic attempts at political ventriloquism – clicking, lobbying, and demonstrating to try to get corporate Democrats to utter messages and enact polices that are progressive. The most longstanding liberal illusion is the party-within-the-party approach, an organized movement to take the Democratic brand away from its corporate sponsors. Some leaders of Labor for Bernie have been explicit about this. It is what Sanders has indicated he has in mind. This approach is has been tried repeatedly by the liberal left since the 1930s and always failed. The inside path of “taking over” the Democratic Party has been tried by labor’s PACs, waves of reform Democratic clubs, McGovern’s new politics, Harrington’s Democratic Socialists of America, Jackson’s Rainbow Coalition, Dean’s Democracy for America, Kucinich’s Progressive Democrats of America, and many, many others, including the fusion parties in New York State over the decades that functioned as a second ballot lines for Democrats: American Labor, Liberal, and Working Families. In every case, they failed. Worse, many of the reform Democrats went over to the other side and became career Democratic regulars. McGovern lieutenants like Gary Hart and Bill Clinton became leaders of the neoliberal New Democrats. The Jackson legacy is a Congressional Black Caucus stuffed with corporate money and almost universally in the Clinton camp. The operatives and the pols backed by the fusion parties in New York State have not only become embedded in corporate-financed Democratic politicians’ organizations, many have been corrupted. By the time it lost its ballot line in 2002, the Liberal Party had become the crassest of patronage machines, brazenly selling endorsements to the Democrats and Republicans alike in return for jobs and contracts. Its successor, the Working Families Party, kept backing Sheldon Silver, the fallen Speaker of the state Assembly (and Clinton Superdelegate), even after he was indicted for corruption. Silver was just sentenced to 12 years for selling his office for financial kickbacks and sexual favors. A top political aide to New York Mayor Bill De Blasio and former Working Families Party campaign manager, Emma Wolfe, has just been subpoenaed in a federal investigation of a scheme to skirt around New York State’s campaign contribution limits. No doubt we’ll be reading in the future about Sanders activists who became careerists and corrupt in corporate Democratic organizations. Many are going to believe that this time it’s different because the Sandernistas are stronger than earlier reform Democratic movements. Sanders is winning over 40% of the Democratic primary votes. These folks are going to pursue the party-within-the-party. Since it is inevitable that some large fraction of the Sandernistas are going to choose this path, the independent left should work with them in fighting for reforms like Improved Medicare for All even if we oppose their Democrats in elections. If they are smart, they will recognize that the independent left is their strategic ally. Without independent candidates giving progressive voters somewhere else to go, the reform Democrats will be taken for granted and lose their political leverage against the corporate Democrats. The illusion of last resort for liberals is lesser evilism. They call on us to vote for the lesser evil Democrat to defeat the greater evil Republican. Here is where Ralph Nader is invoked for “spoiling” the 2000 presidential election. In fact, as a major media consortium found in a thorough $1 million recount, Gore won Florida despite computerized racial profiling by the GOP that disenfranchised tens of thousands of black Democratic voters. The GOP stole the election and consolidated the coup by stopping the recount in a party line Supreme Court vote. But, like GOP climate change deniers, Democratic lesser evil proponents don’t let facts get in their way. Instead of fighting the Republicans, they blame Nader. Of course, a left third-party candidate could well be the margin of difference. The argument against lesser evilism is that voting for the lesser evil paves the way for greater evils. The classic example is the Social Democrats of Germany supporting the conservative Paul von Hindenberg in order to the defeat the Nazi Adoph Hitler in the 1932 German presidential elections. Von Hindenberg won and then appointed Hitler as Chancellor. Hillary Clinton is the von Hindenberg of the 2016 U.S. presidential election. Clintonite prevarication and triangulation will accommodate the right and bring us the greater evils we were afraid of. Hillary the Hawk trumps Trump for the neocons swarming to her campaign. She doesn’t need the left to beat Trump. She’s got the militarists and the corporate elites – and the lesser evil liberals – in a grand coalition for the status quo. The lesser evilists call it strategic voting. It’s really strategic suicide. The corporate center-right personified by Clinton will not defeat the hard right. She will use it to scare the liberal left into accepting her corporate and militarist agenda as the lesser evil. The most effective way to defeat the right is with a left that builds support and power by organizing and campaigning for its own distinct alternative. The Bernie or Bust movement has raised another illusion. If Sanders doesn’t win the nomination, then give him a write-in vote in the general election. At least in this approach they do not lower their flag and disappear into the Democratic Party. But it has its own problems. A write-in vote for Bernie is a vote for Hillary Trump. It’s a vote for Hillary because Bernie supports Hillary. It’s a vote for Trump because it could be the margin of difference in a battleground state. Fortunately, Bernie or Bust recently changed its pledge to “write-in Bernie Sanders or vote Green” and the number of pledgers quickly doubled to nearly 100,000. Jill Stein’s Green Party campaign for president ought to be the first stop for Sandernistas who refuse to vote for corporate Clinton. Stein will give voice to popular demands and movements and help shape political debate during the election. But more than anything, the Stein campaign is a party-building campaign. It’s about securing ballot lines that can be used in future local elections for municipal, state legislative, and congressional seats. It’s about creating campaign committees that continue after the election as local Green parties. Local independent left candidates can win. Kshama Sawant has shown that in her Seattle city council races. Over 150 Greens have shown that in cities and towns across the country. These wins can be replicated all over the country. Many states have non-partisan local elections where independents are not so hampered by partisan loyalties in the two-party system. Due to the gerrymandering of safe seats, most partisan election districts are in practice one-party districts where the other major party does not seriously compete. A left third party can very quickly become the second party in these districts on the road to becoming the first party. Running serious local election campaigns ought to be the second stop for independent Sandernistas. Ballot access barriers, winner-take-all elections, private campaign financing, and inherited two-party loyalties are real obstacles to building a left third party. But the idea that they are insurmountable is just wrong because viable third parties have been built and independent candidates have won. The abolitionist, populist, and socialist parties from the 1840s to the 1930s garnered enough support to really affect American politics. Greens, socialists, and independent progressives, including Bernie Sanders himself, have won office in recent decades. What’s been missing since the 1930s is a left that understands that independent politics is the road to power and change. Most of the self-described left today practices dependent politics. It depends on the corporate-sponsored Democrats to enact changes. Sanders’ campaign has revealed there is a mass base for left party that is ready to be organized. His campaign shows that millions are ready to vote for what public opinion polling has shown for decades – that there is majority support for progressive economic reforms like single-payer, progressive taxation, tuition-free public higher education, and climate action. Sanders’ campaign also shows that millions will fund a campaign for these reforms with small donations at a level that can compete with the candidates of the corporate rich. If the Greens are going to be the vehicle for an independent left political insurgency, they will need to reorganize as a mass-membership party with membership dues and local branches for sustainable self-financing, democratic accountability, and grassroots dynamism. The Greens will remain underfunded, weakly organized, and politically marginal if they continue to be organized like the Democrats and Republicans with an atomized base of voters who only have the right to vote in primaries, with no locally organized base to elect and hold leaders accountable, and with minimal funding from intermittent fund appeals. It is no surprise that so many liberal illusions are being proposed in the wake of Sanders’ campaign. The campaign itself was a liberal illusion that conflated liberal New Deal type reforms of capitalism with democratic socialism. It implied that the social, economic, and environmental crises we face are not systemic, but simply the result of bad leaders and policies that we can replace. Socialism means a radical restructuring of society that socializes and democratizes economic and political institutions. Without an independent left to articulate this socialist vision, “progressive” has come to mean a coalition of liberals and socialists behind a liberal program. The socialist left disappeared as an alternative voice and vision. Working class independence has been the first principle of socialist politics since the pro-democracy uprisings of 1848 erupted across Europe and Latin America. Workers found they could not count on the professional and business classes to support their right to the franchise. They would have to fight for their rights themselves. Exiled “Red 48ers” were among the core of the American abolitionist and populist parties in the latter half of the 19th century. The mass-membership working-class party was an invention of the labor left in the second half of the 19th century. It was how working people organized democratically to compete politically with the older top-down parties of the propertied elites, which had grown out of their competing legislative caucuses. In the U.S., the Greenback Labor and People’s parties of the farmer-labor populist movement won hundreds of offices at all levels up to governors and U.S. senators. They forced their program – from greenback monetary reform and progressive income taxation to labor rights, cooperatives, and public ownership of railroad, telegraph, and telephone utilities – into the center of political debate. The Debsian Socialists, many of them former populists like Debs himself, continued this effective third-party tradition in the 20th century until 1936, when most of labor and the left collapsed into the New Deal Democrats’ coalition. The left has yet to re-emerge as a distinct and visible voice that matters in American politics. 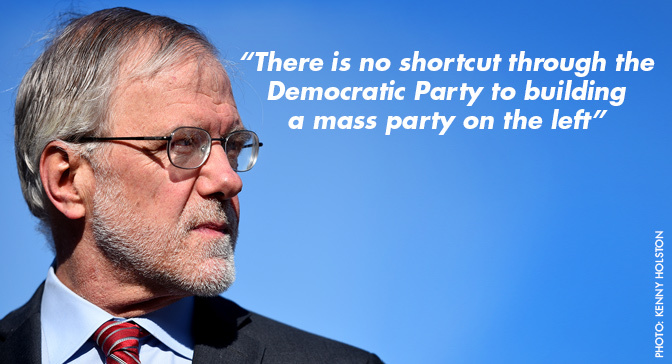 There is no shortcut through the Democratic Party to building a mass party on the left. That shortcut is a dead end. Hopefully, many new activists energized by the Sanders campaign will come to the realization that road to “political revolution” for “democratic socialism” lies not inside the Democratic Party but in an independent left party that is opposed to and starts beating the Democrats.